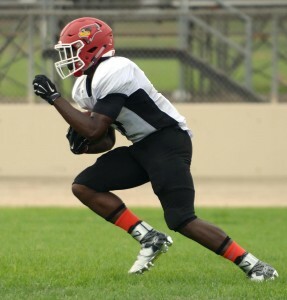 San Bernardino High’s Alexander Mattison made a name for himself rushing for a county-leading 2,017 yards last season as a junior and continued to draw the eyes of college scouts at various offseason football camps. the Mountain Valley League, to stand in his way and try to stop him. But the elephant in the room is what will be next for Mattison following his senior year. Mattison has several scholarship offers which include Pac-12 programs, according to head coach Jeff Imbriani, but it is not a guarantee that the running back will play in the conference. The senior confirmed that Boise State, Washington and Arizona State are at the top of his list. “Out of my offers right now those are the most communicative and interesting to me,” said Mattison. He also mentioned Washington State as a program that completes his top four at the moment. This entry was posted in Alex Mattison, High School football, San Bernardino County, San Bernardino High School and tagged Alexander Mattison, Arizona State, Boise State, High School football, Jeff Imbriani, San Bernardino, University of Washington, Washington State by James H. Williams. Bookmark the permalink.